Clearaudio Nano review | What Hi-Fi? What we have here is a moving coil/moving magnet phono stage with a built-in headphone output. 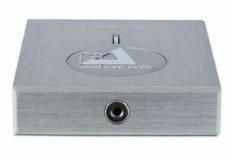 Like all the Clearaudio phono stages we've reviewed, the Nano is beautifully made. It's chunky, solid and nicely finished. Switching between MM and MC gain setting is done by means of a jumper bar, as is the operation of the subsonic filter: this prevents low-frequency noise caused by the turntable from breaking through. There's even the option of changing the cartridge loading, done by swapping (supplied) resistors positioned on the underside of the Nano. In use, the Nano delivers a wide soundstage with much precision when it comes to positioning sounds. Tonally, it's convincing and delivers plenty of detail. Our only issue is that it sounds a little restrained dynamically, and this takes the edge off listening enjoyment a touch. On the headphone side of things it does well, managing to drive Grado's iGrado and AKG K701s without issue. The sonic signature retains the precision and tautness of the line-level output.